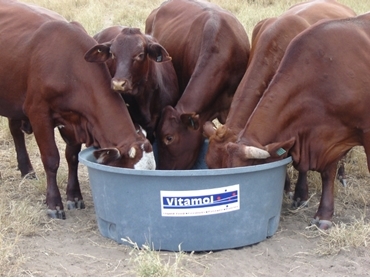 Rumitek offer a range of Vitamol based bulk pasture cattle feed products. Vitamol is a premium molasses based feed supplement with high energy, protein, phosphorus, as well as an excellent balance of minerals and vitamins. Vitameal feed supplement is based on Vitamol but includes cotton seed meal, which adds extra by-pass protein to the supplement. Vitameal is designed for graziers looking for something extra from their supplements and is delivered in bulk loads directly to the farm. Maintain Plus feed supplement is also based on Vitamol but has a slightly lower energy level than Vitamol. It is delivered in bulk loads to the farm storage tank and is also available from some local agents. Maintainis based on Maintain Plus but a slightly lower energy, protein and phosphorus level compared to Maintain Plus. Maintain is delivered in bulk loads to the farm storage tank.